I’ve had my sewing machine for a year now, and I thought I would post a little of my thoughts/opinions on this machine now that I’ve had this long to use it. When I was researching machines, I read quite a few reviews and wished I could have found more, so here’s my two cents worth for anyone out there researching for themselves. My machine is the Bernina 350 PE. Before this machine, I didn’t really have any experience sewing with anything other than basic Singers. After using this machine for a year, I think I can safely say that I will never sew on anything but a Bernina ever again. Even though my machine is one of the more basic models, it has plenty of extras for all my needs. I love its solid construction- I can sew on it for hours and it holds up like a champ! I actually think the 350 is the perfect in-between model for the basic sewist. It’s a step up from basic, so you get a few extras like the walking foot, quilting foot, and some more stitch capabilities, but it doesn’t have all the computerization (and hefty price tag) of the 500+ series. I have really enjoyed free motion quilting on this machine. I mean, I was able to quilt a king size quilt on this baby! Definitely would not have been able to do that on my old Singer. One feature I would definitely recommend is the walking foot. I had a walking foot that came with my old Singer, and I was never a big fan of it. In contrast, I use the walking foot all the time with my Bernina- knits, quilting, binding, etc. My only complaint with my walking foot is that it is pretty squeaky, but they were hoping to oil it up some during the tune-up so I’m hoping that will fix that problem. Another recommendation I have is to go with a local provider. It is so handy to have my local Bernina store to run to when I have any questions or problems with my machine. I think that the 6 week class I took there (that came with my machine purchase) was the best help in teaching me how to use my machine effectively. My final thoughts- I think that this machine will last me for many years. It’s been one year and it still runs just as great as it did when I brought it home. If you are looking for a good quality, well-running machine I highly recommend the Bernina. I am so glad that I got one way sooner than I ever thought I would (Thanks to my amazing husband and his Valentine’s surprise last year!) because it has changed my sewing. I feel that it has taken me to the next level and made sewing so much easier. I think the money investment has paid off in the fact that I spend way less time fiddling with my machine because I can’t get it to work like I wanted it to. Like I said before, I don’t have any experience with the other big machine brands (Viking, Janome, Juki, etc.) but I know that the Bernina is a good solid machine to choose. This entry was posted in Personal, Sewing and tagged bernina 350 PE, bernina 350 review, bernina sewing machine, sewing machine by oliver's fancy. Bookmark the permalink. I have that exact machine, though it’s not as pretty as yours. =) I agree with your review, though my walking foot isn’t noisy…maybe I don’t use it enough. If you have a chance, the quilting extension table that goes with this machine is another added bonus! I think I found mine on ebay, but I’m sure your shop carries one too. 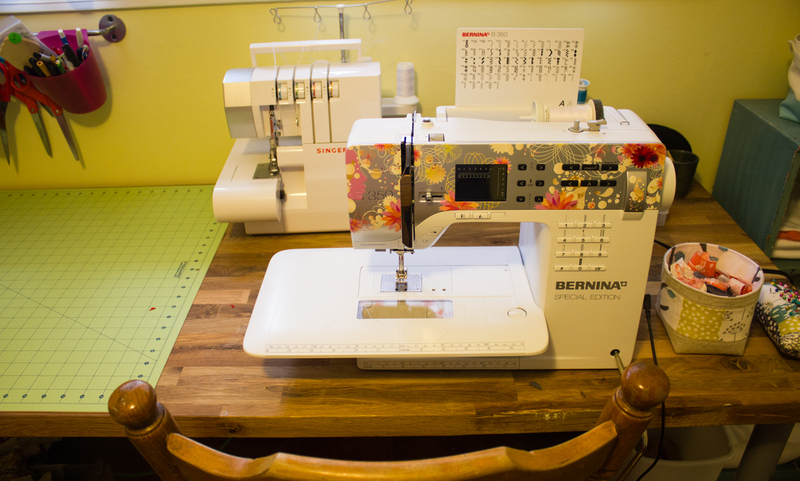 Overall, I hope my Bernina lasts me forever, because I don’t ever want to buy another machine…it’s just right for me. Yeah I think I’d like to get that table eventually. Seems like a nice perk. Not sure when that will happen though. Thanks for the tip! Does this have the stitch regulator? 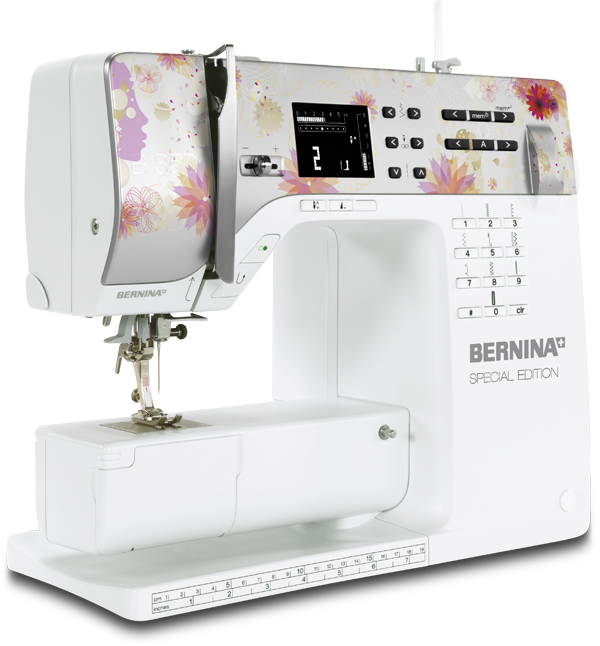 I’ve always wanted a Bernina and i certainly don’t wNt to pay an arm, leg and an organ for one. My main desire is free-motion/machine quilting and I like the Bernina for this feature. Does this have the Bernina stitch regulator? I’ve been wanting a Bernina for years for this feature but don’t want to pay an arm, leg and organ for one. I just want to do free-motion/machine quilting. Sorry for the late reply! I don’t have the stitch regulator but I do have the walking foot and free motion quilting foot and am super happy with those. I don’t feel the need for the regulator. No worries. Thanks for the response just the same. I purchased the 560 last Friday and have my class this Wednesday. I’m not IN love with it yet because it is somewhat intimidating. I’ve used it and there have been user errors, I hope, that make me apprehensive about using it before I take my class. The good news is that I don’t regret the purchase. My machine did not come with the BSR. I purchased a quilting foot and will think about the BSR, but I can get so many feet for the price of that one. Anyhoo, I appreciate you taking the time out to respond.